Jeppesen is gradually releasing a series of new VFR+GPS paper charts that, according to the company, "offer a fresh perspective on what a VFR chart should be with intuitive symbols and colors, better coverage areas and an emphasis on GPS navigation." For a comparison of the new charts with conventional sectional and terminal area charts, see my review at BruceAir.com. CH Products has updated its line of flight yokes with the Eclipse, an all-in-one yoke that includes an innovative solution to the "rudder problem" and several new features that put scores of customizable controls at your fingertips. My review of the Eclipse is in the Product Reviews section of www.BruceAir.com. The FAA is publishing hundreds of new RNAV approaches each year, and the agency has emphasized the production of WAAS-based procedures with LPV (localizer performance with vertical guidance) and LNAV/VNAV minimums. Indeed, as of August 27, 2009, in the U.S. there were 1,820 approaches with LPV minimums versus 1,318 category I ILS procedures. These approaches, like conventional precision approaches, have minimums set at a DA (decision altitude). For several reasons, procedures with LPV and LNAV/VNAV minimums are classified as “semi-precision” approaches (technically, they are APVs—approaches with vertical guidance), but to a pilot, they are (usually) functionally the fraternal twins of an ILS. To fly to an RNAV approach with LPV or LNAV/VNAV minimums, you track a course like a localizer and then intercept and descend along a glide path that, in the cockpit, looks like the glideslope on an ILS. You continue the descent on that glide path until you reach the DA published for that approach. These charts illustrate the principle of a DA. By definition, at the DA, you must begin a missed approach if the requirements set out in 14 CFR Part 91.175 aren’t met. Many books, including FAA training handbooks, emphasize that, after you reach the DA, you can’t continue flying along toward the airport as if the DA were an MDA (minimum descent altitude) defined for a non-precision approach (i.e., a procedure without a defined descent path and that provides only lateral guidance). But exceptions (albeit poorly explained at present) exist. 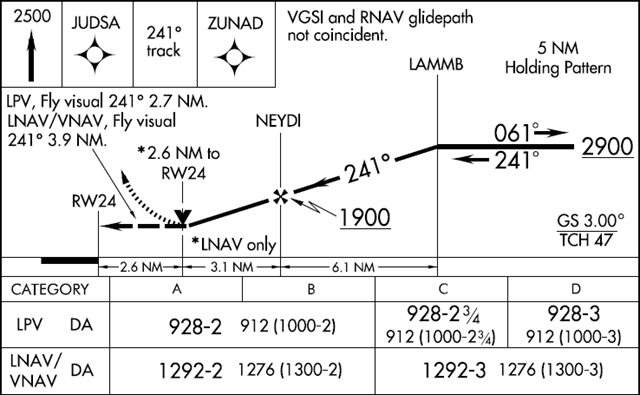 Consider the RNAV (GPS) RWY 32 approach at Reno/Stead (KRTS). It includes a “fly visual” segment from the DA to the threshold—a charted distance of 4.1 nm if you fly to the LPV minimums. But the visibility requirement for the LPV minimums is 2 miles. In other words, at the DA, if you have 2 miles visibility, you can continue flying toward the runway until you see the approach lights, the runway, etc. You aren’t required to begin a missed approach at the DA as you would on a conventional precision approach. 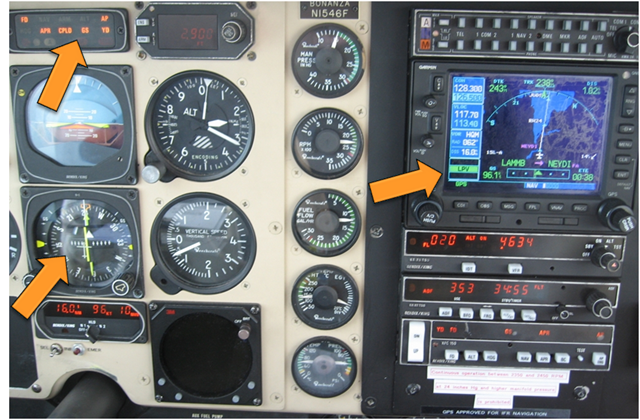 The minimums section for procedure above includes separate “fly visual” notes for the LPV and LNAV/VNAV minimums. You can find similar notes on RNAV approaches at many airports, especially those, like KHLN, set amid mountains. The instructions on these charts are superficially clear. When you reach the DA—even if you don’t see the approach lights, runway, or other cues required by 14 CFR Part 91.175—you can “fly visual” a specified distance to the runway and land—provided you have the flight visibility specified in the minimums section for that approach. But the instructions leave many questions unanswered. For example, can you continue flying along the glide path, or must you remain at the DA, maintaining it as if it were an MDA, until you see the runway environment? Must you fly the specified course to the runway? What if you don’t pick up the lights or the runway and begin a missed approach after you descend below the DA (i.e., fly past the point where the final approach course and DA intersect)? Are you protected from obstacles until you’re established on the charted MAP? And what about 14 CFR Part 91.175? Doesn’t flying past (and/or below) the DA without the required visual references violate the regulations? Instrument procedures designers perform a visual area obstruction evaluation off the approach end of each runway authorized for instrument landing, straight-in, or circling. Restrictions to instrument operations are imposed if penetrations of the obstruction clearance surfaces exist. These restrictions vary based on the severity of the penetrations, and may include increasing required visibility, denying VDPs, prohibiting night instrument operations to the runway, and/or provide a “Fly Visual” option to the landing surface. 1. In isolated cases, due to procedure design peculiarities, an IAP may contain a published visual flight path. These procedures are annotated “Fly Visual to Airport” or “Fly Visual.” A dashed arrow indicating the visual flight path will be included in the profile and plan views with an approximate heading and distance to the end of the runway. The depicted ground track associated with the visual segment should be flown as a “DR” course. When executing the visual segment, the flight visibility must not be less than that prescribed in the IAP, the pilot must remain clear of clouds and proceed to the airport maintaining visual contact with the ground. Altitude on the visual flight path is at the discretion of the pilot. 2. Since missed approach obstacle clearance is assured only if the missed approach is commenced at the published MAP or above the DA/MDA, the pilot should have preplanned climb out options based on aircraft performance and terrain features. Obstacle clearance is the sole responsibility of the pilot when the approach is continued beyond the MAP. The FAA Administrator retains the authority to approve instrument approach procedures where the pilot may not necessarily have one of the visual references specified in CFR 14, part 91.175 and related rules. It is not a function of procedure design to ensure compliance with part 91.175. The annotation “Fly Visual to Airport” provides relief from part 91.175 requirements that the pilot have distinctly visible and identifiable visual references prior to descent below MDA/DA. *Updates to the AIM since the original publication of this item in 2009 have moved the description of “fly visual” segments to the Arrivals section and to the Pilot/Controller Glossary. To find the current language, it’s best to search a PDF (or other digital copy of the AIM for fly visual to the airport and PUBLISHED INSTRUMENT APPROACH PROCEDURE VISUAL SEGMENT. Additional clarification, including updated language in the Instrument Procedure Handbook and updated chart formats (perhaps including separate approach plates for APVs and LNAV-only procedures), may be forthcoming, however. The visual references required by 14 CFR Part 91.175 do not apply. At the DA, you are not required to have the runway environment in sight, but you must have the required visibility and be able to continue clear of clouds. The authority to waive the requirements of 91.175 resides in the preamble to a revision of 14 CFR Part 91. The visibility and cloud clearance requirements of “fly visual” apply until the aircraft can then be positioned for a normal descent to a normal landing on the runway. Obstacle clearance is solely the pilot’s responsibility after descending on the glide path beyond the DA on an LPV or LNAV/VNAV approach. Do not continue on the glide path beyond DA unless you are certain you have the required visibility and have a plan for getting back onto the MAP should you need to discontinue the approach. 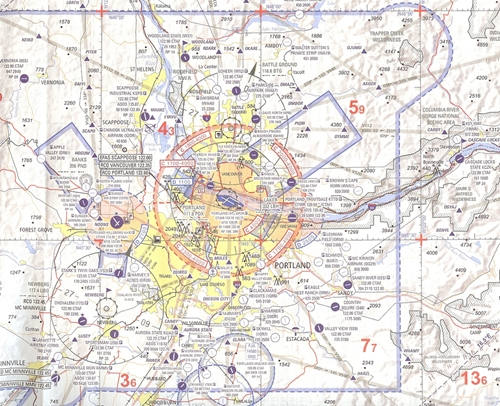 The altitude and course flown during the “fly visual” segment are at the pilot’s discretion. Provided you are able to maintain the charted visibility and remain clear of clouds and obstructions, you need not stay at the DA (i.e., flying it as if were an MDA). You may descend on the guide path beyond the DA. In other words, at the DA you decide “Do I meet the visibility, cloud and obstruction clearance requirements to continue?” If so, you may continue on the glide path. Continuing on glide path beyond DA does not provide the obstacle clearance guaranteed by the missed approach procedure climb profile. If you descend on the glide path beyond the DA, you assume responsibility for determining how to meet the missed approach climb requirements. 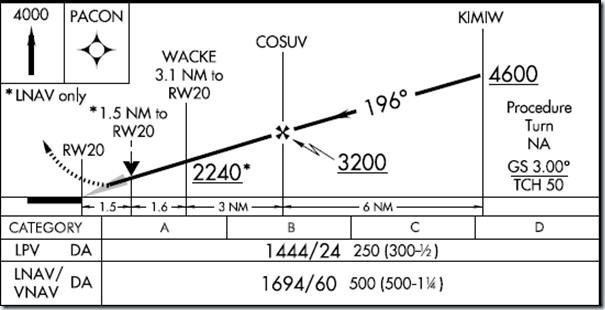 One way to determine how to get back to the correct climb profile is to look at the non-precision LNAV MDA and missed approach point. For example, at KHLN, the MAP is the threshold for runway 27 and the MDA is 5440 ft. A pilot flying the LPV or LNAV/VNAV glide path beyond the DA point who figures out a way to climb to be above 5440 ft. by the time he or she reaches the runway 27 threshold is back in position to meet the missed approach climb requirements for the MAP. PowerPoint presentation by Bruce McGray of the FAA to the May 2009 meeting of the Aeronautical Charting Forum, Instrument Procedures Group (ACF-IPG) (PDF minutes of that meeting are here). AFS-400 answers (Microsoft Word document by John Collins) to common questions about “fly visual” segments. I just posted a couple of videos on YouTube that show a typical first flight for one of my stall/spin/upset students and an introduction to inverted flight and recovery from inverted flight. The pilots on these flights are typical GA flyers. Neither had previous experience with spins, aerobatics, or unusual attitudes beyond those practiced in private pilot training. They usually fly Cessnas and Pipers. Their initial reactions are typical. They both find the experience initially disorienting, even though we’ve completed an extensive ground briefing that includes videos like these. Like most folks I’ve flown with, they react slowly and hesitantly because they’re in new situations. I was no different when I began flying aerobatics. That’s why I focus on a variety of stalls and incipient spins and build up to developed spins–and why I include basic aerobatics in the syllabus. That progression gives folks opportunities to experience a wide range of unusual attitudes, become accustomed to Gs (we try to keep loads within the normal category limits), visualize the lift vector, and reinforce the idea that angle of attack, not pitch attitude relative to the horizon, is the critical concept. I flew my Extra 300L from Seattle (KBFI) to its winter home at Boulder City, NV (KBVU) on September 27. It’s the annual fall migration for the airplane (there’s not much point in having an aerobatic airplane in Seattle during the monsoons). I’ll bring the airplane back to Seattle in May. I enjoyed excellent weather for the trip, which included fuel stops at Bend, OR (KBDN) and Yerrington, NV (O43). You can see the essential data for each leg in the table below. The Google Earth (.kmz) files for the planned route (magenta) and the actual track (orange) are available in one of my SkyDrive folders (links below). As you can see, I was able to take a few shortcuts, especially on the first leg out of Seattle. If the Extra were equipped with an autopilot, I would have taken pictures of the spectacular sunrise over the Cascades. But it’s not a hands-off kind of airplane.